There is something about a pop of sunshiny yellow that just makes me happy! When I made this card, I was kind of thinking about making something that could be one of those elusive "guy" cards. You know the ones...not TOO pretty, just the right amount of arty? This is how I achieved the cool texture on the black layer: I first used the Chevron Textured Embossing Folder. After giving it the chevron texture, I rubbed my Versamark pad across the raised areas quite liberally. Then I poured Stampin' Emboss Clear on it and tapped away trying to get the extra powder out of the grooves. Most of it would not budge. However, I ended up loving the effect of the clear powder in the random grooves. I used one of the Word Bubble dies to cut the shape from a piece of Daffodil Delight I had and the "enjoy" word was cut using one of the dies from the Mini Treat Bag Thinlits available in the 2015 Occasions Catalog. Finished the whole thing off with a few randomly placed Candy Dots from the Brights collection and an envelope liner made using the Envelope Liner Framelits and Back to Black Designer Series Paper. I encourage you to try the technique I used for the black layer. Don't get too caught up in where the powder lands. Just go with it! Enjoy your Monday. As always, let me know if you have any questions about the project or any of the Stampin' Up supplies I've used. When Life Gives You Lemons: It's A Happy Thing! I love watercolor and all of it's possibilities. I also love that you can use Stampin' Up! inks to watercolor with. 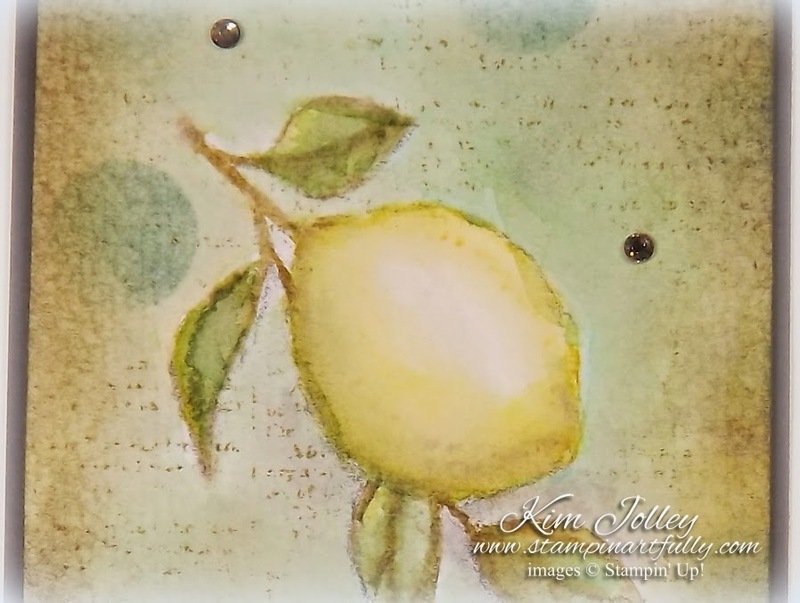 This sweet little lemon and the sentiment are from the Sale-A-Bration stamp set "A Happy Thing". During Sale-A-Bration, if you spend $50 (before tax & shipping), you can choose the set as your free gift. It is wonderful colored with our Blendabilities markers on Whisper White cardstock, but look how yummy it is stamped and watercolored on our oh so awesome watercolor paper! Instead of stamping this image with one color, I used markers to color directly on the stamp. For the leaves (Old Olive), the stem (Baked Brown Sugar) and the lemon (Daffodil Delight). Don't for get to "huff" on your colored image when you do it this way, so the inks on the stamp will be moist enough to leave an image behind. Don't worry in this case if the image isn't perfect, you can fill in and correct it when you paint it. Next: find you some lemon art online to help you with where to do the shading. Start out slow and I find that in this instance, it is better if I either let a section dry or use my heat tool to dry it before I move on to the next section. This keeps the colors from becoming muddy and blending more than you want them to. I worked on the lemon first, dried it, then moved on to the leaves. One more little trick I can suggest: take a soft lead pencil and barely go around the edges of your stamped image. It ends up giving your images some instant depth. I did the background last using watered down ink, then stamped a second generation image of the Stampin' Up! Dictionary background stamp with Baked Brown Sugar. Used the Dots decorative mask with a sponge & Lost Lagoon ink. Sponged the outer edges with Early Espresso. Stamped the sentiment & added Rhinestone Basics colored with Crumb Cake Blendabilities. I have listed the particular colors of reinkers I used for this project below. If you have any questions about any other specifics of this project, let me know. Hope your Sunday is amazing. Don't forget to Pay Art Forward when you can. You might just delight someone's day, week or even their year by sharing something you made yourself. 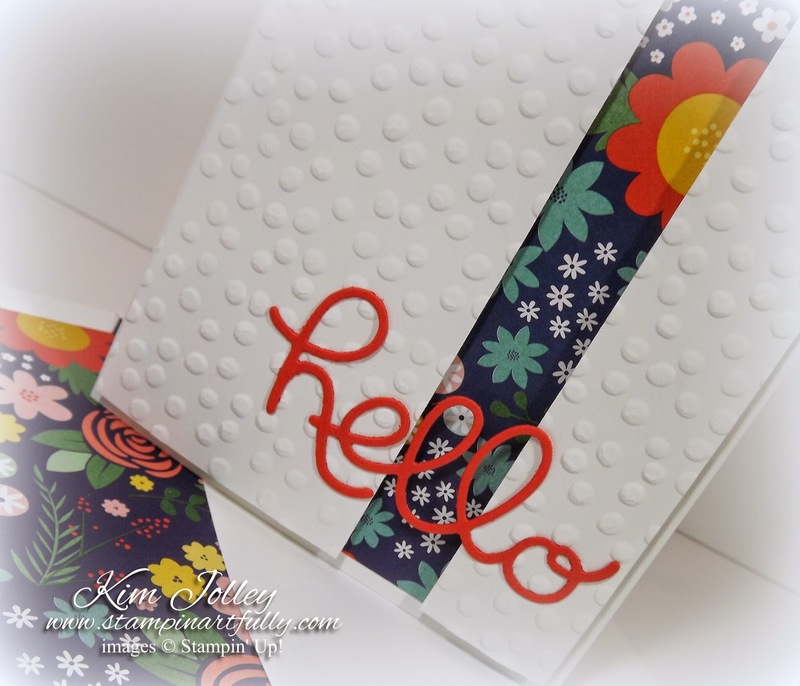 Pals January 2015 Blog Hop: Hello Occasions! 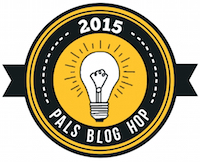 Welcome to the Pals Blog Hop of 2015. We hope our new year is off to a great creative start. To celebrate the start of a new Stampin' Up! year, we are showcasing products from our newest catalog this month-the Occasions catalog. 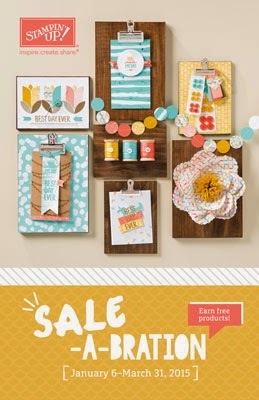 You may also see new Sale-A-Bration products too. If you don't know how to earn free Sale-A-Bration products-contact your Stampin' Up! demonstrator. You may just be starting the blog hop or you may have come from Martie Pollard's The Crafty Bandit Blog, #22 on the Pals Hop. If you get off track at any time, the full line up below will help you move along from blog to blog so you see all of the amazing creations. In. Love. With. Trees. Specifically the Sheltering Tree stamp set from the 2015 Occasions Catalog. I saw some artwork last week on Pinterest that inspired me to create both of these cards. The artist had painted the simple tree in the center of her canvas, then she had this explosion of color around the tree. In addition to using reinkers for my watercolors, I also accented and deepened the colors on the edges with some sponging. Don't you just love the way the embossed portion of the tree jumps out at you? I ended up using a stamp from the Gorgeous Grunge set to put some added specks of white. I just love Real Red mixed with Mossy Meadow. Such a rich combination! I only used a few of the images from the Sheltering Tree. There are several great word stamps and even a cuter than cute bicycle! "How to" slideshow and product list below. The next stop is Beth Beard's My Little Craft Blog, #24 on the Pals Blog Hop. Hope you enjoyed this post! Let me know if you have any questions. Brrr...its cold outside and gray skies have been giving me the winter blues. Wishing for sunny skies and brighter days, so I thought I would make something cheery using the fab new word Thinlits from the Crazy About You bundle from the 2015 Occasions Catalog. I was inspired by a card I saw on Pinterest. 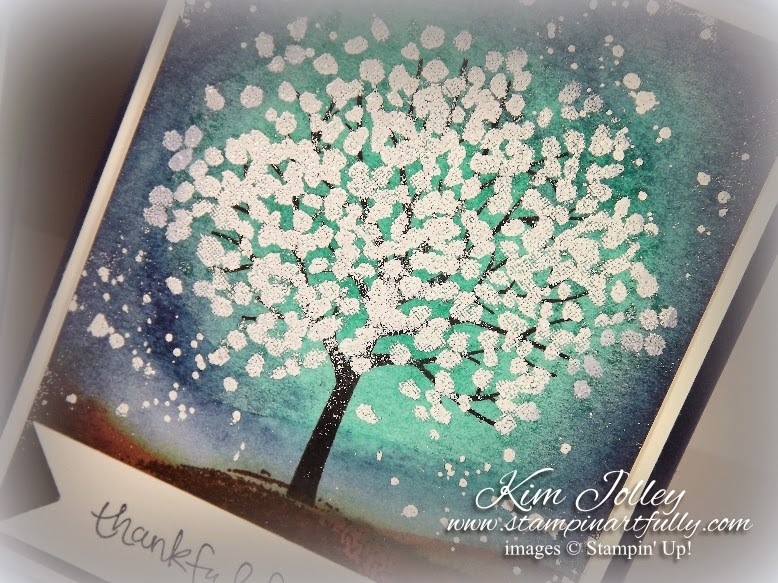 This card was SO simple to make...I could sit and play with this watercolor look for hours! I put some tiny drops of the 3 different colors of reinkers (Coastal Cabanna, Melon Mambo & Daffodil Delight) on one of our acrylic blocks. Those blocks work great for a palette. If you don't have the reinkers, just gently squeeze your ink pad (while closed) to transfer a bit of the ink on to the lid and use the lid of the ink pad as your palette. I started with Melon Mambo. I brushed some water on to Stampin' Up! watercolor paper in the center, then dabbed a little reinker on to the wet area and moved it around with my handy dandy Stampin' Up! Aqua Painter. Once the color "splat" looked like I wanted it to, I dabbed a bit with a paper towel to remove some of the standing water, then dried with my heat tool. I went on to paint every color in the exact fashion, drying in between. It's not that I mind the colors blending on the edges, but I wanted the colors to be more defined for this card. I custom colored the Rhinestone Basics with the matching Blendabilities. Don't forget that Sale-A-Bration is going on now! Earn yourself a FREE Stampin' Up! product gift with every $50 purchase. (before shipping & tax) See all of the Sale-A-Bration details here. New Weekly Deals today! Save up to 25% on the items below. There are also still some amazing items on the clearance rack. Go make something to cheer you up today, then give it away to someone who needs cheered up. That's the way to Pay Art Forward! 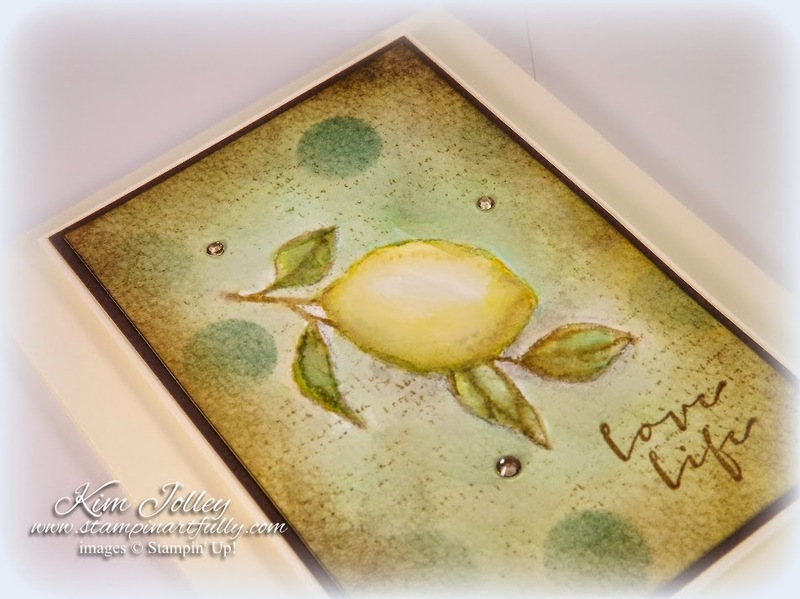 I have the immense honor of being the guest stamper today on Mary Fish's Stampin' Pretty blog. I had followed Mary's beautiful blog for several years before ultimately signing up as one of her downline. Ask any of my stampin buddies..., I am a complete sucker for butterflies. They will tell you I have been a bit obsessed with them for several years. 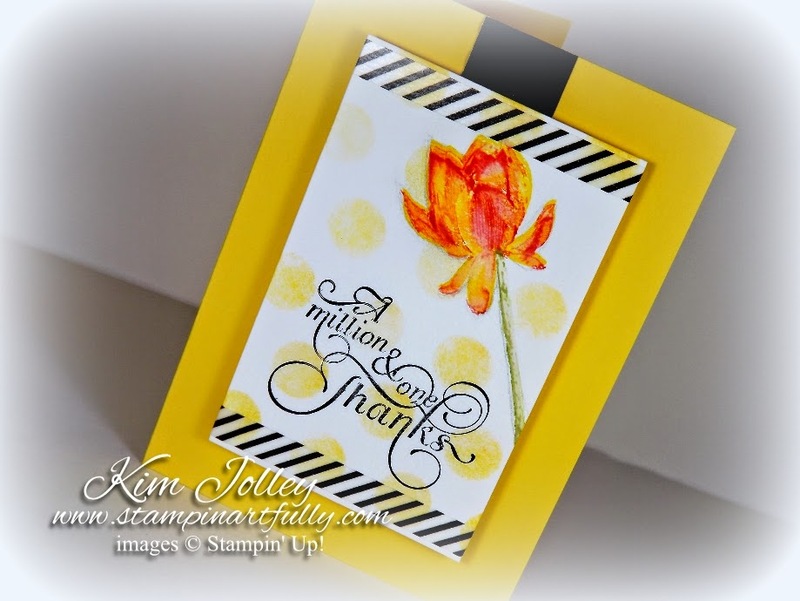 So...I was over the moon excited to see the new Stampin' Up! 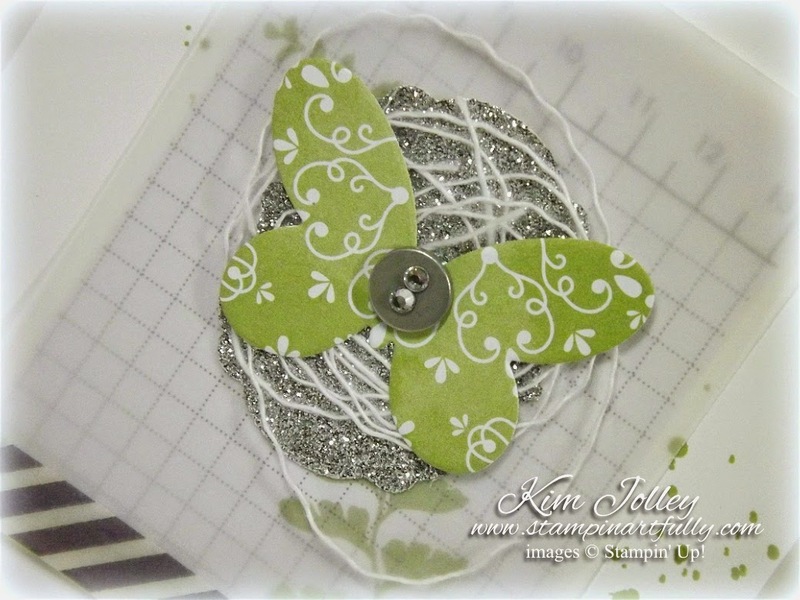 Butterfly Basics stamp set with the coordinating way cool Thinlits dies in the 2015 Occasions Catalog. My stampin' buddies will also tell you I like to use things I have on hand in unusual ways. For instance, take a look at the Stampin' Up! Grid paper below. Look how great it looks under the vellum! I purposely cut a piece that had the numbers along the top, I thought it added a lot of interest to the piece. 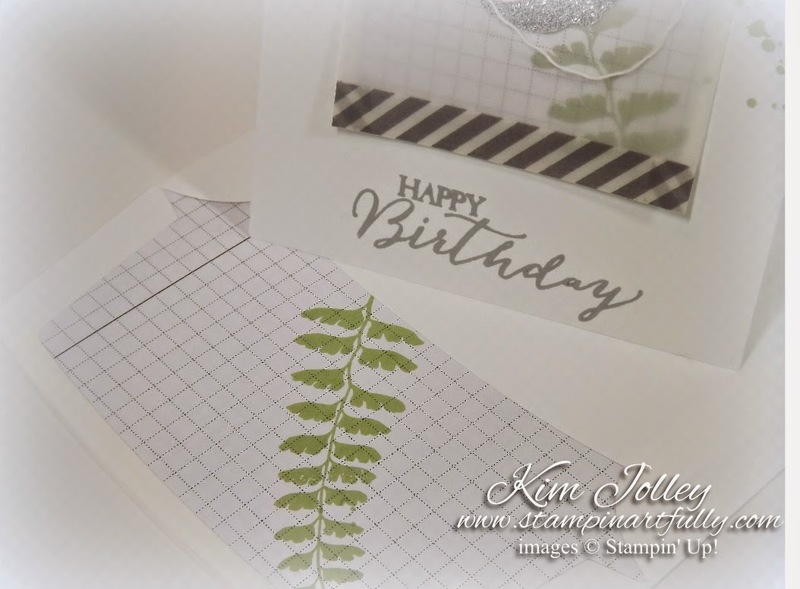 I stamped the fern stamp on it, then layered the vellum over it. The butterfly was cut from a left over piece of the All Is Calm DSP. (I don't think it looks like holiday paper at all when used this way) Also, since I wanted the Whisper White Bakers Twine behind the butterfly, I needed to do something else with the button, so I covered the holes with the smallest stones from our Rhinestone Basic Jewels. I finished this project off by stamping another piece of the grid paper to make my envelope liner with. I just love how it looks! 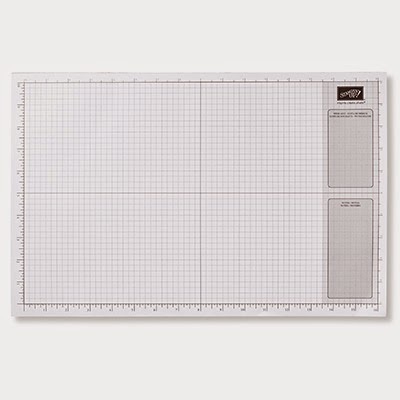 I think the grid paper would also be great with masculine cards. Don't forget that Sale-A-Bration is going on! Earn yourself a FREE Stampin' Up! product gift with every $50 purchase. (before shipping & tax) See all of the Sale-A-Bration details here. As always, if you have questions, please ask away and I will and I will try to answer as quick as I can. Thanks for looking at my blog today! Valentine's Day is just around the corner. For that reason, I've started thinking about what card (cards) I want to make my husband. 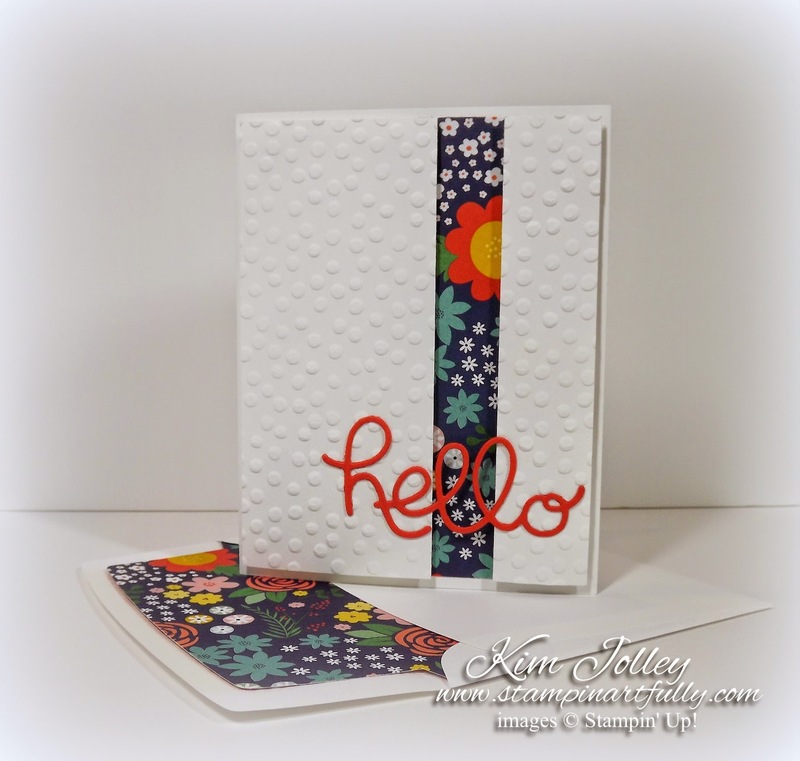 I am quite enamored with the new Stampin' Up! Stacked with Love washi tape in the 2015 Occasions catalog AND the new word thinlits. I simply cut & scored the Whisper White card base, then applied the washi tape vertically on the sides before layering up the Kraft panel. 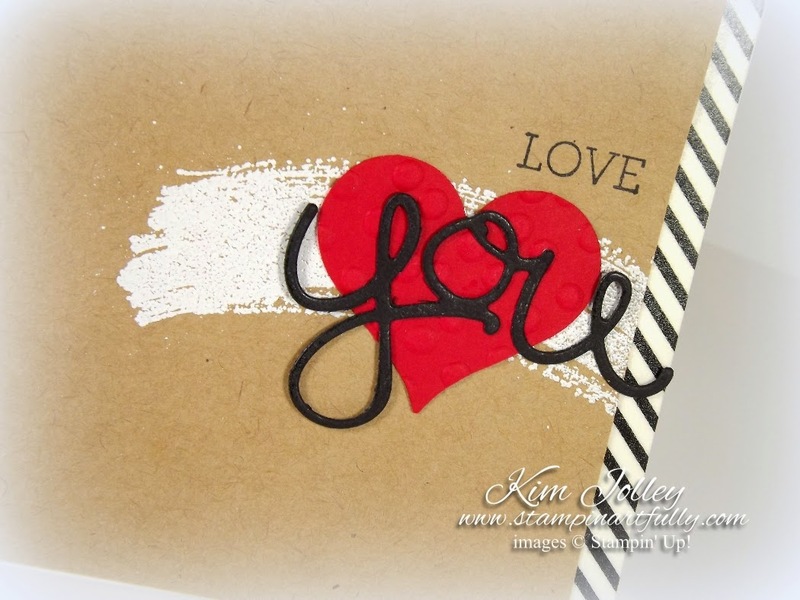 I thought the "brush stroke" stamp from Work of Art (embossed with with White Stampin' Emboss powder), made a great back drop for the heart and word. The heart was embossed with the Decorative Dots Textured Impressions folder. I had a snippet of left over washi tape that I did not want to go to waste, so I made my own "stamp". This is a great way to carry the design of your card over to the envelope. See the tiny flecks of embossing powder around the brush stroke image? This was not intentional, but I quite like it. I even used my embossing buddy first to cut down on the possibility of this happening. However, this is what I have figured out: our Kraft card stock appears to be much more porous than our regular card stock. The extra flecks have nothing to do with static on the paper. In other words, when you stamp on it with Versamark, the image doesn't stay quite as wet as when you stamp on our other card stock with the same ink. 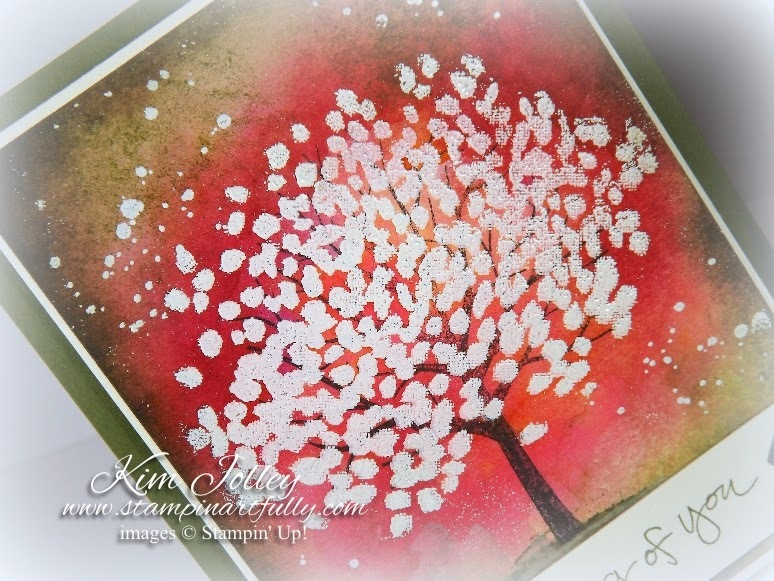 Get your embossing powder on there quick and keep in mind that since the image isn't quite as wet, some of the powder may blow on off and give you a very "artsy, I meant to do that" look! Don't forget that Sale-A-Bration is going on! Earn yourself a FREE Stampin' Up! product gift with every $50 purchase (before shipping & tax). All the Sale-A-Bration details are HERE. Enjoy your day...if you wind chill is what mine is, stay warm! Sale-A-Bration 2015 & the New Occasions Catalog Starts Today! This is one of Stampin' Up's largest sales events of the year and runs from today through March 31. There are 3 ways to earn free products! Free product! For every $50 you spend on products (before shipping and tax), pick out a Sale-A-Bration gift free. Click here to see the catalog. Earn Bonus Host dollars on-line or in person! This is a great time to stock up for yourself or grab some friends and combine your orders. 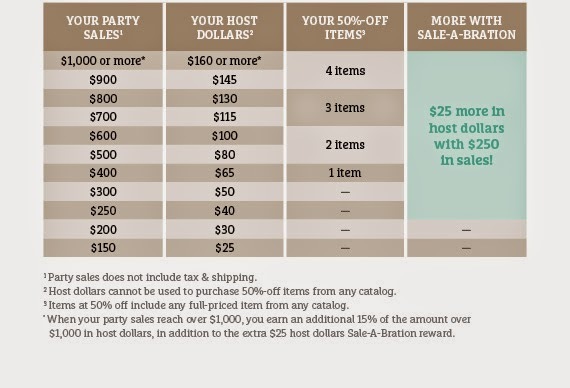 If you place an on-line order or have an actual workshop through me and the order totals $250 or more (before shipping and tax), you will earn a $25 host bonus, in addition to the regular host benefits and the free gift for every $50 you spend (before shipping and tax) during Sale-A-Bration. 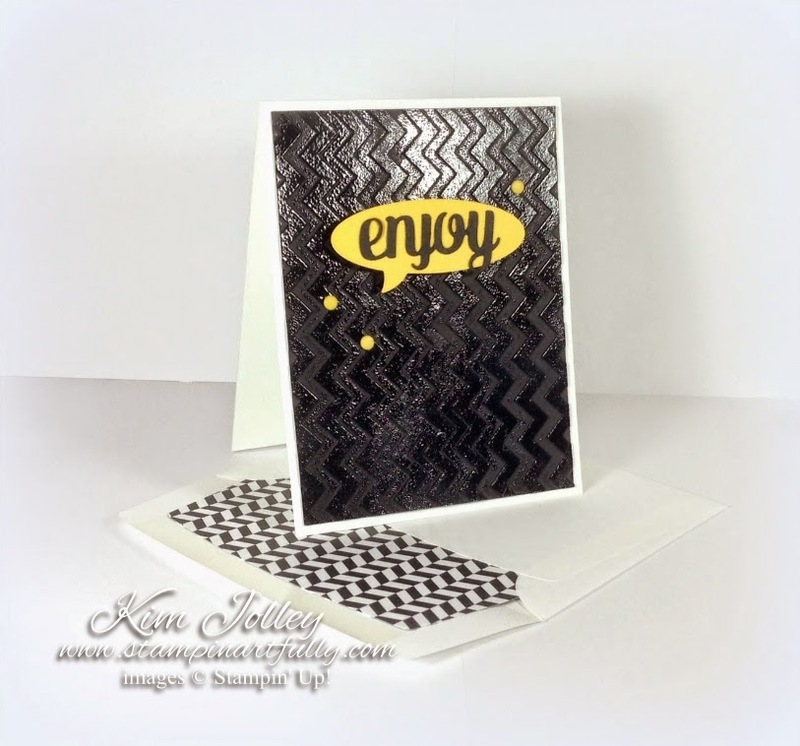 On the fence about joining the fun as either a hobby stamper or demonstrator looking to have your own business? Your time is limited! The Starter Kit Special runs from January 6 - March 31, 2015. Build your own kit! Choose up to $125 in Stampin' Up! products for your kit (including 15% off bundles). That’s $26 in FREE product! drive” demonstrator discounts and benefits. Ready to join my team and have some fun? 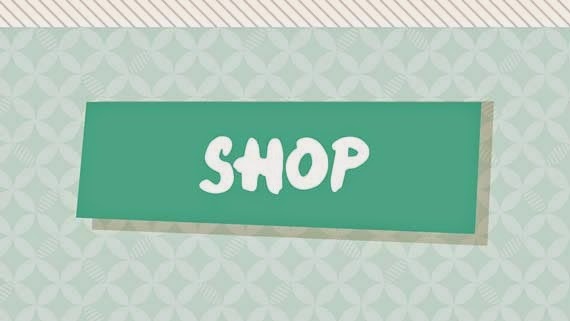 Shop now from the new Stampin' Up! Occasions Catalog. These items will be available between January 6 and June 2, 2015. Please contact me with any questions. Off to play with my new stamps! I am back from my holiday staycation. I needed some time to recharge my batteries AND play with all the cool new toys from the 2015 Stampin' Up! Ocassions Catalog and the Sale-A-Bration Catalog. You will be able to order from both starting tomorrow!! What do you think of the word die?? Isn't yummy? This comes in a set of 4 word dies called "Hello You" and can even be purchased in a bundle with an amazing LARGE set of stamps that accompany the word dies wonderfully called "Crazy About You". This card was inspired by some scraps I was sorting through. I just love the Flower Pot Designer Series paper and using it to make the matching envelope really brought the entire project together. It brought some cheer to my day during some very cold weather we are having. There are still some great year end close outs with savings of up to 80% off and one more day to take advantage of the current weekly deals with items up to 25% off.